The most important thing to understand about security is that it is not a bullet point item. You cannot bolt it on at the end of the development process. 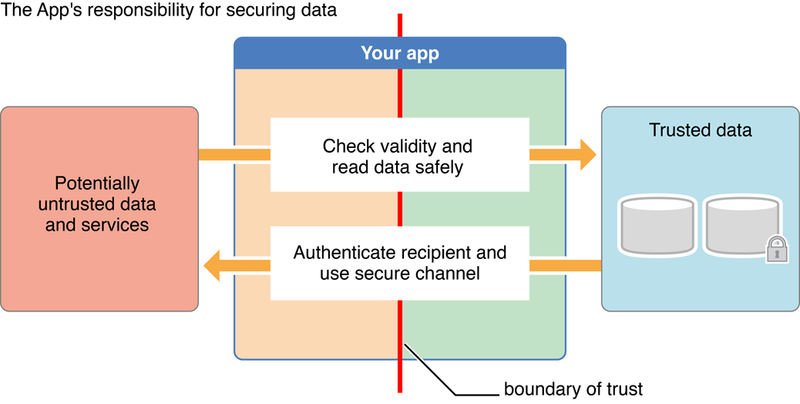 You must consciously design security into your app or service from the very beginning, and make it a conscious part of the entire process from design through implementation, testing, and release. Keep users’ personal data safe from prying eyes. Store the data in a secure way, and ensure that your software collects only the information that it requires. Treat untrusted files and data with care. If your software accesses the Internet or reads files that might have previously been sent to someone over the Internet, your software must properly validate the data. If it does not, it might inadvertently provide a vector for attackers to access other personal data that may be stored on the user’s computer or other mobile device. Protect data in transit. If your software transmits personal information over the Internet, you must do so in a safe and secure fashion to prevent unauthorized access to or modification of the data while in transit. Verify the authenticity of data where possible. If your software provides access to or works with signed data, it should verify those signatures to ensure that the data has not been tampered with. This document assumes that you have already read Mac Technology Overview, iOS Technology Overview, or both.